Cranberry Crunch Total is a winner. It's flavorful, filling and respectfully healthy. You get a cranberry piece in nearly every bite. The dried cranberries here are sweeter than your average fresh or canned Thanksgiving Day cranberries. And that fruity sweetness permeates the entire box, such that - on the rare occasion that you get a spoonful without a berry piece, you still get a snoot full of the flavor. As far as the "crunch" goes... the oat clusters in this cereal are very small and on the scale of overall cereal-crunchiness, they rate very low. However, this is probably a good thing. The berries are just slightly chewy. To have a bang-on crunch next to that texture might cause a little mandibular dysphoria. As it stands, the clusters are crunchy enough to be called crunchy, but not crunchy enough to call attention away from wheat flake texture of the cereal. I found that the one cup recommended serving of this cereal filled me up and kept me satisfied until lunch time. As for nutrition... one serving contains 100% of your daily recommended intake for 11 vitamins and minerals, including Calcium, Vitamin E, Vitamin B6, Vitamin B12 and Zinc. There's just one gram of fat per serving and zero trans fat. Each serving contains 4 grams of dietary fiber and 1 gram of soluble fiber. The only thing to watch out for is the 15 grams of sugar, which is a little high when compared to similar cereals including some other varieties of Total. Overall, this cereal is a must-try. I know that I'll buy it again someday. 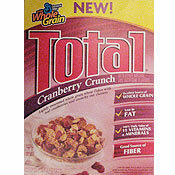 What do you think of Cranberry Crunch Total? Anyone know where I can buy this in the UK? This is one that would be too sweet for many but if you like sweet cereals, you will love this one. The bonus is you can substitute it for your multivitamin. I was unable to locate it in our local grocery stores but have recently found it in Western PA at Target. I really like this cereal, but it is quite sweet. I might try mixing it with regular Total. The crunch part was fine and overall texture was fine. But taste was tooooooo sweet! Every mouthful was like eating and smelling brown sugar. Where do you buy this? I have waited here in Eastern NC, (Jacksonville) for a darn year. They have every kind but this one. Ugh! 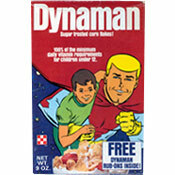 I'm mad, they release this great cereal and now they are not showing up in stores anymore. Did they discontinue it? My kids (2&4) loved it!